It's incredibly straight forward and will instantly give you a valuation price in a few easy steps. Enter your details below. 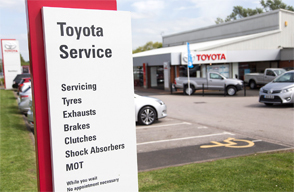 Motorists in Warrington and the wider Cheshire area can access superb Toyota cars and professional aftersales support by visiting Bentleys Toyota directly. We are proud to stock a wide selection of vehicles from the respected manufacturer, and our line-up includes everything from compact city cars to clean hybrid vehicles and confident SUVs. Both new and used examples are stocked at our dealership, and you can be sure of a great deal when taking advantage of the special offers found online today. If buying new, there are all the latest-generation models from Toyota, and each has been designed to meet the varied needs of motorists. You can explore our full range online, and book a test drive to sample any individual vehicle before making a decision. For added value, shop from our current collection of Approved Used Toyotas, which is frequently updated. You can buy with complete confidence, as every car on our forecourt is first checked and tested by our technicians to ensure they meet the high standards we demand. Click through the used range today before enquiring directly for details. Bentleys support continues even after your purchase - we deliver a wide choice of aftersales tasks including servicing and MOT testing that can be booked online in moments. Our technicians use the latest tools to maintain your Toyota’s superb condition, and fit genuine parts sourced from the manufacturer itself. These items are also for sale at competitive prices, as is a diverse range of model-specific accessories. To benefit from unrivalled aftersales care – or for any other enquiries – please visit your local Bentleys dealership. Where can I find Bentleys?